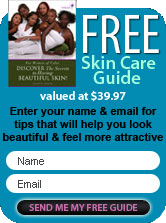 There are many skin care regimens for different skin types and even for different skin shades. So a guide to choosing cleansers and how to use them is important. What remains constant, however, is that the routine must include cleansing. African American skin care, for instance, begins with the right cleansing techniques. Cleansing should be done on a daily basis (and done properly for that matter) especially since black skin is easily afflicted with whiteheads and blackheads and it is also prone to acne. Therefore, cleaning is a must if you want to maintain your beautiful black skin and its glow. While it's easy to find a cleanser in a beauty store filled with African American skin care products, choosing one that is natural and appropriate for your skin can be a challenge. Take time to do your research since you'll be using the cleanser regularly. When you wake up in the morning, before you retire at night, when removing makeup, when your face is oily ... you'll need a cleanser. So make sure to grab one that will really remove oil and dirt but still take care of your skin. First, choose a gentle cleanser. Particularly if your skin is sensitive (which is the case of most people with black skin), you need a black skin care product that won't strip moisture from your face even if you use it frequently. Aside from the word "gentle", look for "hypoallergenic", "fragrance-free", and "soap-free". Opt for non-comedogenic cleansers to avoid formation of whiteheads and blackheads. Next, select a cleanser for your skin type. The best way to do this is to check the label and watch out for ingredients that could aggravate or start skin problems. For example, dry skin can be harmed with the presence of salicylic acid and benzoyl peroxide. Aside from these, black skin care products containing propylene glycol, fragrance, alcohol, and dyes should also be avoided. Choose a cleanser with the proper pH level, one that will bring balance to your skin. In general, if the product is too acidic on one end or too alkaline on the other end it can cause challenges for your skin. Lastly, avoid soaps as they can be harsh and drying to your skin. Go for gel cleansers, Aloe Vera is preferred, that are also oil-free and alcohol free, if you have oily skin. Cream based or milk cleansers can be very good for African American skin. They are gentle enough to use on your skin but will be effective in removing excess oil and dirt. Over-cleaning, either from too frequent washing or from rough techniques, can do more harm than good to your skin. Keep in mind that most skin problems are not caused by dirt so refrain from over-cleaning if your concern is actually clogged pores, acne, or uneven skin and not dirt. The recommended frequency is no more than three times daily. Make it a point to wash your face before bedtime. It is a common misconception that an oily face should be washed often. On the contrary, frequent washing can make your glands produce more oil to make up for the oil removed during cleansing. Also, when cleaning your face, do not use hot water because it can lead to drying. When black skin is too dry, it will start to flake and become ashy in appearance. Aside from the fact that it is the first skin usually noticed, facial skin is more delicate than the skin on other parts of our body. Therefore, it requires a more delicate cleansing than the rest. Do not use abrasive cleaning products and keep in mind all the African American skin care tips discussed above. You can simply use your fingertips when applying and massaging the cleanser onto your face. Do it in circular motion. Rinse well then apply a toner and moisturizer. Occasionally exfoliate to get rid of stubborn dirt and dead cells. If you need more help in choosing the right cleanser, consult your dermatologist or a black skin care specialist.